I hope everyone had a good week. Mine felt super long. One of my bright spots this week was that my Get A Grip editorial got a good response. I’m basing that on the comments, traffic, and LRG responses. I don’t live or die for clicks and comments. If I did that, then I would have given up on this site a looooong time ago. But it did feel good knowing that people read it. Simple pleasures. – This picture had me staring at it like a stereogram. I could only make out pictures on the wall. – 50 Flesh starting at $6 is worth a look. – “CHUNKY INVESTMENTS.” That explains the $199.99 price tag. – $60 BIN – guess the item. – I wish she would be eBay Entrepreneur Exchange #2. – “Get it now or possibly never.” I think some people are just born into Sales. – “The condition is nice – Though there is scattered lite soiling and some have red marks on bottoms of feet” I would say that is generous. – A few years ago, wasn’t there a guy failing to selling these in every color? For like $20. – Prototype or sloppy factor scrap? I never know what to believe. – This should be an auction. It would get close to the BIN. The BIN doesn’t encourage anybody to buy. – If the rank had been General, then I would have bought four. Captain. Pff. I wasn’t going to do AOTW because you can take all of the M.U.S.C.L.E. auctions and put them into two categories: (1) AOTW candidate; and (2) worth talking a look. However, this guy really struck a chord with me. #233 has no Class A or Class B versions. And it was only made in five colors. Purple isn’t even the best version (it’s Light Blue, if you’re curious). The best thing about the #233 figure is that he was the last one on the poster. Maybe that’s why I hate the $8.95 BIN price. Or maybe it is the price mixed with the auction title: 1 Super Rare Vintage M.U.S.C.L.E. 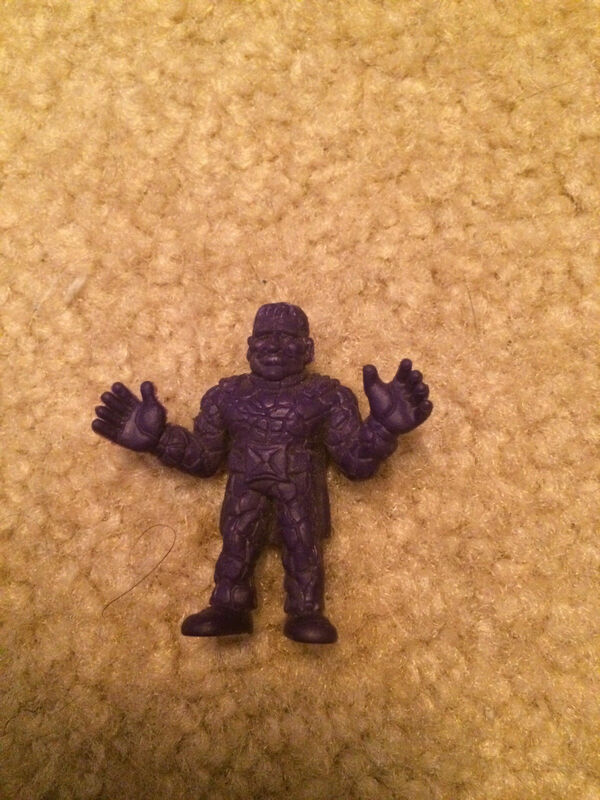 Men #233 Kinnikuman Kinkeshi (Purple Variant). 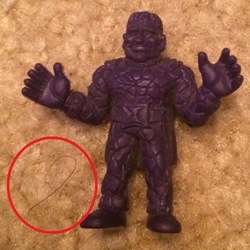 Or maybe it is those two things – plus what looks like a huge pubic hair in the picture. What do you guys think? Pube? This entry was posted on Friday, November 6th, 2015 and is filed under UofM News. You can follow any responses to this entry through RSS 2.0. You can skip to the end and leave a response. Pinging is currently not allowed. You need to apply the choke test. That hair looks like it would make you gag. A cat hair would make you think you’re going to sneeze and have your eyes water. Definetly a pube. That disgusting discovery makes me wanna sanitize all my 233’s.